Empowerment of women is a barometer for development of any society. Over the course of the last few decades, some progress has been made in creating political space for women in Balochistan. However, the composition of cabinet and elections for local bodies indicate a shrinking space for women in the politics of Balochistan. In October 2013, 15 member cabinet of Balochistan took oath and it did not have a single woman. There is no woman advisor or parliamentary secretary in Balochistan as well. In the last government led by Nawab Aslam Raisani, there were a handful of women ministers. Not to mention, a female deputy speaker during the last phase of that government. Compared to that, the current political setup in Balochistan is a step backwards for political empowerment of women. Balochistan achieved the distinction of being the first province to conduct local bodies elections. How the government machinery was used to influence the elections and why the process took over 14 months is a different story altogether. Coming back to the point, in local bodies polls not a single woman was elected on general seats. Elections took place for 1,450 positions for offices of chairman and deputy chairman of district councils, municipal corporations, municipal committees and union councils. There was not a single woman among the 1,450 people elected for those offices. Not a single woman was issued a ticket for contesting election on these seats, let alone winning any seat. The disturbing facts hint at a mindset that doesn’t believe in women empowerment. Two of the ruling parties National Party (NP) and Pashtunkhwa Milli Awami Party (PkMAP) claim to be progressive parties. In their manifestos, both these parties show their commitment towards empowerment of women. In practice, it is a concept alien to them. The current government of Balochistan, led by a so-called ‘middle class’ chief minister proved to be even worse compared to the last government which was led by a tribal chief, in terms of political empowerment of women. Shazia Langove, secretary for women affairs Quetta-chapter of NP, rejects the premise that the current government is to be blamed for the exclusion of females from political setup. She claims that “voters in Balochistan have not reached the level of awareness where they would vote for a female. That’s why no tickets were issued to women in local bodies polls.” In an attempt to prove the commitment of her party to women empowerment, Langove said that unlike other political parties, women members of provincial assembly (MPAs) of NP have the freedom to use the development funds at their discretion. Jafar urged the women politicians of Balochistan to stand up against the narrow minded male-rulers who have pushed back the small gains made in women empowerment after decades of hard work. It’s true that Balochistan is a tribal society where women don’t enjoy the same level of freedom as they do in urban metropolitans such as Lahore and Karachi. Tribal cultures of Balochistan notwithstanding, many women have made it to the cabinet several times in the past. Therefore, this rationale which shifts the blame on society is actually misplaced. The political dynamics of Balochistan are different from other provinces. Here, MPAs are mostly tribal chiefs who join political parties to become ministers. There is a race among MPAs to get a ministry and the total number of ministerial slots is restricted to 15, thanks to the 18th Amendment. In such a situation, ideals such as women empowerment and gender equality become after-thoughts. In order to justify the exclusion of women, male-rulers then fabricate excuses pertaining to religion, culture and society. 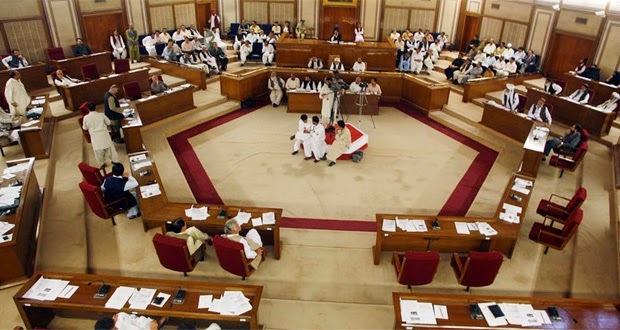 There would have been no woman in Balochistan Assembly if there were no reserved seats. The same formula can be applied to ensure a significant participation of women in the cabinet and other positions of power. Constitution should be amended to set one-third quota for women in federal as well as provincial cabinets. Only, this constitutional guarantee can help ensure the representation of women in cabinet, in a misogynistic and male-dominated society. Women empowerment doesn’t seem to be a cause of concern for many due to all sorts of crises affecting Balochistan at the moment. However, Balochistan and Pakistan for that matter can never develop into true democratic societies without empowering women in politics.